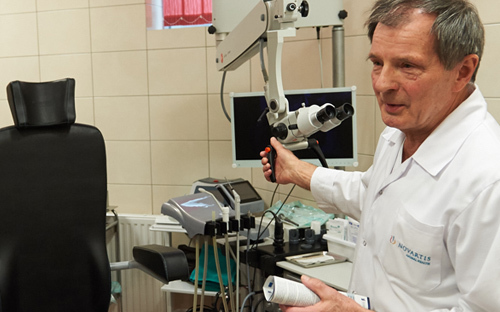 The jury distinguished Prof. Andrzej Kukwa, Head of the Department of ENT and Head and Neck Diseases of the University of Warmia and Mazury (UWM) for developing and constructing a device to help people suffering from snoring. The analyser very accurately determines the patency and efficiency of respiratory tract. The device enables testing individual nostrils and the oral cavity separately. For many years Prof. Andrzej Kukwa has been studying how Poles breath, identifying causes of breathing disorders and treating these causes (sometimes surgically). “Correct breathing is essential for our health”, argues Prof. Kukwa. “Many patients underestimate this issue. People do not believe that they could have problems with breathing, it boggles their mind that something as obvious as breathing might be done incorrectly. Our analyser proves it unquestionably”, stated Prof. Kukwa. Breathing disorders may cause many diseases which are commonly believed to be unrelated to breathing, including arterial hypertension and cardiac dysrhythmia. “When less oxygen is delivered to a body, the number of red blood cells increases and the blood becomes thicker and the heart must put in more effort to pump it. Furthermore, hypoxia prevents our body from burning fats”, claimed Prof. Kukwa. The analyser developed in the Faculty of Medical Sciences of the UWM is also useful for determining the physical efficiency of athletes. “We want to treat pregnant women in a special way because this group should pay special attention to correct breathing”, emphasised the researcher. The airflow analyser was constructed, apart from Prof. Kukwa, by Szymon Nitkiewicz from the Faculty of Technical Sciences of the University of Warmia and Mazury and Robert Barański from the AGH University of Science and Technology in Cracow. To test the analyser, Prof. Kukwa’s team tested a group of 200 students from the university in Olsztyn.